So all of this blog stuff is happening on a mATX PC powered by an AMD FX 6300 CPU with 16G of RAM and a 250GB SSD and a 1TB HD. The motherboard is an old MSI 7641 ver 3.0 and doesn’t even have USB 3.0. But I actually used the PCI x1 slot for a PCI to PCI Express adapter card that gave me an extra PCI-E slot. And I put a USB 3.0 adapter card in that. Two half-height cards in one ancient PCI x1 slot. Cool! The graphics card is a humble GeForce GT610 card. Nothing fancy, but it does an easy 1080p display, which is what I need on my Acer K242HL. Plenty of display for me. I spend a lot of time in a terminal window as you can see in the picture above! Occasionally I use a graphical editor, like Sublime or Atom or something, but most often it is easiest just to use Vim in a terminal. 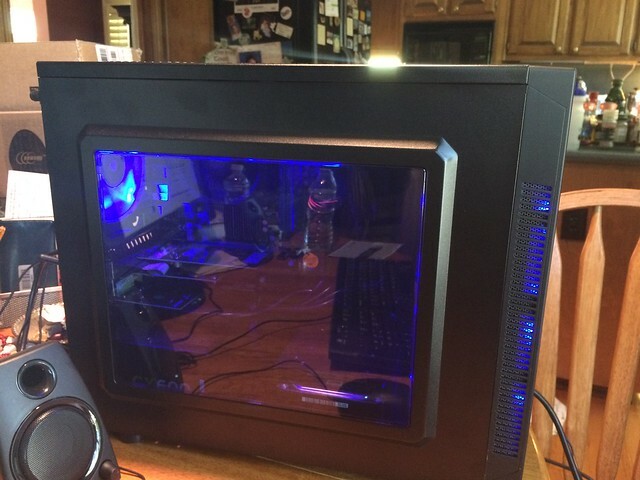 The box has a bunch of blue LED case fans from Corsair. I love Corsair. I use their products all the time! The case is an 88r, which is one of my favorites. Doesn’t take up much space, yet it doesn’t waste any either. It doesn’t look like it, but there is lots of space behind the motherboard for cable management. There’s room for a couple of SSDs, a couple of HDs, and even a DVD, which I use to watch reruns of Magnum, PI and other old TV shows I have on DVD. Sound is provided by a pair of Logitech Z130 speakers. Very inexpensive. But to my ears they sound much more expensive! They sound great. You’ll notice my desktop is the Cinnamon Environment ver 3.0.7. It’s Fedora 24 and kernel 4.7.7. Oh, and I’m running an 802.11ac card, so I have wicked fast wireless. I had some adventures getting the card recognized by the kernel, but once I enabled 3rd party kernel mod repos, I could patch my source tree and compile the new support in. Broadcom’s sources are proprietary, and hence the heartburn in a Fedora system. Running the driver requires that I ‘taint’ my kernel, apparently. Okay. But it works, and I like it. Sorry RMS! The box is still awaiting a place to live. Um, I’m out of space at the moment. This box is named “peanut,” after one of my earliest Himalayan kitties. All the boxes are named after famous pets, pretty much. There’s one box that doesn’t follow that scheme. I have 13 boxes right now, and I seem to have a slight PC building addiction. I built four boxes earlier this month, and they’re looking pretty nice too. Two Mint and two OpenSUSE boxes. One is Tumbleweed and the other is Leap 42.1. And both the Mint boxes are 18 (“Sarah”). Some of the boxes dual boot from Windows. I only boot to Windows to play Steam games, typically. The rest of the time I’m at home in Linux. Yep, Linux is my home!